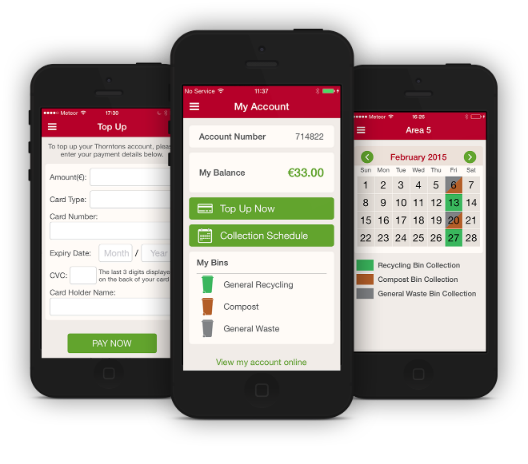 Thorntons Recycling wanted to optimise their customer experience by providing a customer self-care app; a convenient, user friendly way for customers to manage their accounts via their phones. Operating since 1979 Thorntons provides a one stop shop waste solution to over 60,000 Irish customers daily. The solution: a customer self-service app. The lack of route information and difficulty accessing collection schedules created a demand for a product like this and Thorntons were keen to invest in technologies that bring excellent value and enhanced service to all of its customers. The challenge for Púca was to develop a customer self-service app that would allow customers to access to their accounts and provide them with real time information and service updates. The new app allows customers to link the app to their existing account so they can check their account balance, top up their account “on the go” using Realex payment, access collection schedules and calendar information. Similarly the app gives customers access to other Thorntons services like ordering a skip. Customers now have the ability to top up and manage their accounts at the touch of a button saving them time and effort. Customers will also receive notifications regarding their account balance and service days using Púca’s push notification platform. Púca collaborated closely with the Thorntons team throughout the development of the App, which includes integration with the back-end customer database and Realex payments. The app is available on both IOS and Android devices. With Smartphone ownership skyrocketing, the Thorntons customer self-service App provides a service channel that is convenient, has “always on” availability and no call waiting. Thorntons will be able to decrease costs by deflecting calls from their contact centre and improve customer satisfaction by allowing customers to easily top up their account on the go. Planned features for future releases will include deeper integration with back-end processes, enhanced payments capability and bin collection history. A top 10 download in the app charts within days of release, and number one in the Utilities charts, the Thorntons app looks set to augment the companies’ continued service improvement in their sector. Visit the Thorntons website to find out more and download the app.